For the 2016-17 academic year, NPC proudly recognized 58 Alumnae Panhellenics for their work to advance the sorority experience. NPC annually recognizes Alumnae Panhellenics with achievements in areas such as programming, College Panhellenic relations and recruitment information events through the Citations of Merit and Programming Excellence Awards. 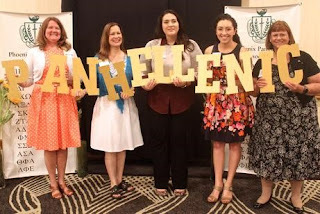 Alumnae Panhellenics are evaluated on their programming accomplishments, submission of the Alumnae Panhellenic annual report and continued administration of their Alumnae Panhellenic online account. NPC also recognized the Atlanta Alumnae Panhellenic as the biennial winner of the 2015-17 Harriet Macht Outstanding Alumnae Panhellenic Award sponsored by Delta Phi Epsilon. It recognizes excellence in communication, programming, scholarship and service. Previous winners include Phoenix Alumnae Panhellenic (2013-15) and the Coachella Valley, Calif., Alumnae Panhellenic (2011-13). Both Atlanta Alumnae Panhellenic and Phoenix Alumnae Panhellenic have answered questions about the Harriet Macht Outstanding Alumnae Panhellenic Award application process, what it means for their Alumnae Panhellenic to win and how they plan on sustaining excellence. 1. Do you have any suggestions for Alumnae Panhellenics in completing the award application? One thing that would help is to commence the planning process at the beginning of the biennium. Print a blank form and distribute a copy to each member of the executive board. As you plan your association’s activities during the next two years, use the application as a guide to ensure that all, or most, of the criteria are met. When completing the application, clearly, but concisely, answer every point, adding extra sheets if needed. Begin working on it early enough that you are not pushed to meet the due date. Most important: apply for the award every biennium! 2. What does it mean to your Alumnae Panhellenic and community being selected as the Harriet Macht Outstanding Alumnae Panhellenic Award winner? Atlanta Panhellenic’s 21-member organizations work very hard to achieve excellence in all areas. They are so proud to be the recipients of this very prestigious award. AAPA has received recognition from the Governor of Georgia, the City of Atlanta and has been recognized as an Outstanding Georgia Organization, but to be recognized by NPC has a special meaning. 3. How do you foresee upholding Alumnae Panhellenic excellence in the future? For the last 90 years, Atlanta Panhellenic has been serving the greater community through our programs, communication, scholarships and philanthropic efforts. Going forward, we will continue to expand our focus, as needed, in each of these areas, continuing current programs and exploring others. Social media has become a driving force in promoting all that we do, and we view it as a means to convey a positive message of Alumnae Panhellenic excellence and the overall Greek experience. 4. Do you have any words of encouragement or suggestions for Alumnae Panhellenics across the country that are striving towards excellence? Focus on the basics: Collegiate support, scholarships, philanthropy and communication. Start with small objectives, and they will grow. Being a well-rounded organization is, in our opinion, as important as the numbers and/or dollars that come from your investment of time and talent in each of these areas. 1. As an award winning Alumnae Panhellenic, do you have any suggestions for keeping records for your Alumnae Panhellenic? Each officer and committee chairwoman is given a thumb drive, containing information on all aspects of that office or committee, which is passed on annually to the next officer. Each officer adds to it each year, so officers and committees continue to build on a solid foundation. Officers also have access to a designated email address so they can easily see and reference past communications. We try to start each new year on a firm foundation without having to re-design every aspect of the position, although new ideas are always welcome. Dropbox folders have also been created for executive board and committee chairwomen to access. Phoenix Panhellenic also maintains a database in Excel that includes all Panhellenic officers, council delegates, alumnae club presidents and treasurers; Panhellenic contacts at Arizona universities; and past Panhellenic presidents and Panhellenic Women of the Year. This list is updated as needed and provides a database to contact Panhellenic women in our area. We have also been keeping this list current with past council members as we look forward to our upcoming Centennial Celebration in 2020. 2. Since being selected as the 2013-15 Harriet Macht Outstanding Alumnae Panhellenic Award winner, how have you sustained Panhellenic excellence through this new biennium (2015-17)? Phoenix Panhellenic continues to have strong communications between executive board, committees and council. We host an annual summer retreat to make sure the incoming executive board and committee chairwomen are trained to understand the “big picture” as well as the particular duties and timelines for their office. Goals are set at this retreat, and expectations, responsibilities and timelines are annually reviewed and updated. It is also a great way for the new leadership team to get to know one another. Sunflower Shout-outs! are included at every meeting to recognize the time, talents and treasurers of our sorority women, committees and alumnae chapters. Photos are taken at meetings with our Sunflower sign and then are posted to social media. Anyone may submit a Sunflower Shout-out! but they are typically received from executive board, committee chairwomen and council members. 3. Do you have any words of encouragement or suggestions for Alumnae Panhellenics across the country that are striving towards excellence? Phoenix Panhellenic’s executive board is chosen by rotation and has a 5-year commitment. Two years in advance, contact is made with the president of the next group to start the rotation to seek out potential delegates and to encourage participation and familiarity with our council. Executive board members are required to have served on Phoenix Panhellenic for at least one year prior to starting the rotation. Although the delegate selection remains up to the alumnae club, we look for women who possess an enthusiasm about Panhellenic; exceptional interpersonal, communication and organizational skills; and the ability to motivate others through effective communication of desired objectives to engage all members. This time of year, photos and posts of families traveling to college campuses fill our social media newsfeeds. We have all seen the images of thousands of eager students arriving on the front steps of their new home for their next — or even their first — academic year. I am unsure who tops the chart for most anxious: the student or those delivering them! For me, these posts bring back a plethora of memories of excitement and concern; the most poignant trepidation for the safety of my daughters on campus, in their residence halls, at off-campus events and in the community. September kicks off National Campus Safety Awareness Month, which helps raise awareness about issues affecting campuses throughout the nation, including personal safety, substance abuse, sexual assault, interpersonal violence and hazing. Campuses offer programming designed to raise awareness and educate students. On many of those campuses, sorority and fraternity communities are vigilant in providing opportunities for education and participation in communitywide safety initiatives and exposure to campus resources. Again this September, the National Panhellenic Conference (NPC) launches the student safety initiative The Red Zone (#TheRedZone). The social media campaign is designed to raise awareness about the vulnerability female students face during their first 90 days on campus. NPC and its 26 member organizations are resolute in women supporting women on college campuses. Sororities create communities that offer safe spaces for women built on respect for one another. Hazing or any act of individual degradation is never condoned or tolerated by NPC member organizations. This commitment to combat hazing could be seen this July when NPC joined a host of fraternal “umbrella” organizations and higher-education professionals to endorse new anti-hazing legislation called the 2017 Report and Educate About Campus Hazing (REACH) Act. Also during the month of September, NPC and its member organizations partner with HazingPrevention.Org to actively promote and engage in National Hazing Prevention Week Sept. 18-22. While writing this message and considering the safety and well-being of students back on campus, Hurricanes Harvey and Irma are affecting the lives of thousands. To our students: Be safe and respect the safety of one another. To our families: Please know that through our network of partnerships with campus administrators, staff and the 26 member organizations, NPC stands prepared to assist, support and help ensure student safety on college campuses.